Eczema is a common disorder in the U.S.
Atopic dermatitis, also commonly referred to as eczema, is a chronic skin disorder that usually affects very young children, and may last until adolescence or adulthood. Atopic dermatitis or eczema causes the skin to turn red, inflamed and itchy, causing a severe urge to scratch. Eczema sufferers’ skin is excessively dry and scaly. Eczema can affect all areas of the skin, but typical locations are the arm and knee bends, wrists, and ankles. 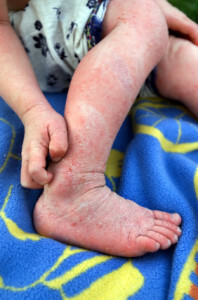 Symptoms of atopic dermatitis can range from mild to severe and can reduce the quality of life significantly – both for the child suffering from the disease and the parents dealing with the child’s nightly scratching attacks. Allergo® high-tech microfiber fabrics are tested and certified to provide complete allergen retention. This highly effective barrier helps eczema sufferers avoid contact with dust mite allergens in their bed and alleviate or prevent their nightly symptoms. At the same time, Allergo® encasings are highly breathable, creating a pleasant and healthy sleeping climate. This is especially important for eczema sufferers, since a hot and sweaty sleep environment typically intensifies redness and itching. 4) Atopic dermatitis and aeroallergen contact sensitivity. Adinoff AD, Tellez P, Clark RA. J Allergy Clin Immunol. 1988 Apr;81(4):736-42. 5) Sensitization to aeroallergens in atopic dermatitis patients: association with concomitant allergic diseases; Celakovska J et al. Journal of the European Academy of Dermatology and Venerology; Dec 10 2014.